Serious researchers in the sciences are likely already familiar with arXiv.org, Cornell’s open access digital repository for preprint scientific articles. Now it’s possible to browse, search for, skim, and save scientific articles available at arXiv.org when you're on the go, thanks to arXiview for the iPhone. 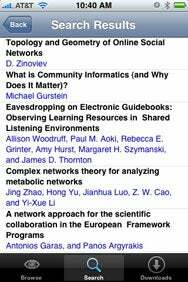 Research Goes Mobile: Browse, search, and download articles from the open-access arXiv.org digital repository with arXiview for iPhone. ArXiview’s research features are appropriately basic for a mobile device: users can browse arXiv.org’s contents by date and subject, skim easy-to-read abstracts, search by title, keyword, or full-text contents, and even save PDF articles to folders within the $1 app. In addition, the application offers a very convenient option to e-mail the article’s URL, title, authors, and abstract, which makes it flexible enough to fit into different research workflows. You can save PDFs locally for offline reading—for quick reading, this is nice, but without an easy method to transfer PDFs to the desktop, it isn’t a perfect research tool. In any research application, search tools are essential. arXiview’s search interface is adequate, but suffers from some quirks. I ran several test searches to compare results from the Web site and the mobile app. The app returned different results, though since arXiview lacks result sorting options or the total number of results, it's difficult to compare the two accurately. The app also lacks Boolean logic support, which the Web site provides. Overall, Dave Bacon’s arXiview is a promising tool for scientists and academics, but not quite an essential research application at this point. arXiview is compatible with any iPhone or iPod touch running the iPhone 2.2.1 software update.